Keeping your cash register running smoothly is vital to your business, and Choice receipt paper is a product that gets the job done. Designed to fit standard credit, debit, and POS machines, Choice credit card paper rolls are made of quality 2-ply paper that produces both a white and yellow copy of a receipt for the customer and business owner. The paper is BPA free, so you can hand a copy of the receipt to your customer without having to worry about the side effects of the harmful chemical. The long length of the rolls also ensures you won't run out often and cause delays in the check-out line. Also make sure to check out other great items from Choice, DYMO, Innovera, Quality Park and Universal. Almost all businesses today rely on credit card paper rolls to supply their customers with a printed receipt of their purchases. 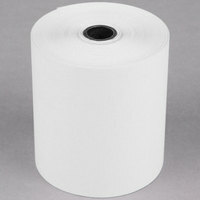 Choice receipt paper is an economical pick for your check-out line needs. Whether you’re providing customers proof of their payment or keeping records for your own books, their paper is a dependable product that helps you stay organized. For more check-out line products, look at our cash register stands, heavyweight paper grocery bags, and plastic grocery bags. If you're wondering where to buy choice receipt paper and credit card paper rolls, we have a large selection of choice receipt paper and credit card paper rolls for sale at the lowest prices.